Roaming alone is boring but it gives you ample time to plan and execute trip. Travelling with many people, you hardly able to concentrate on trip aspect and spends most of the time other than trip like stop over for food, relaxation etc. I was glad it got skipped when I visited white mountain while my brief stay at Portsmouth, NH. At Portsmouth colleague told me about this beautiful mountain range in NH. He specifically mentioned fastest wind speed is recorded at top of mountains. I right away decided I have to go there because of my age old connection with Sahyadri Ranges. On beautiful Saturday morning I started to white mountains, plan was very simple, just drive north on 16 N for 100 miles and you are on top of white mountains-- Mount Washington. I like simple travel, person like me who is direction bind and get easily lost this was perfect destination. So driving on 16 N for a 2 and 1/2 hr was not an issue. When you travel in USA you just get awed by the natural resources country has, especially lakes and river. At each lake and river you want to stop absorb blue colour which nature has to offer. Watching various boats anchored and people spending their weekend at the shore or inside lake. Although I don't like modern equipments in water especially motor boats because of it's noise and pollution cause by it. I hardly realized how two hours of journey passed because of lakes, mountain ranges and keeping eye on Harley Davidson bike gangs. While driving you have to careful about two wheelers and these guys will just come in 10-12 numbers and you re sure you have to drive quietly on free way. Also at rest area I noticed most of them coming from Canada-- especially from Quebec and mostly talking in French. After quick bite of apple, oranges I decided to drive to top of mountain since there was no time for me to walk all the way to top and car was rental so I don't have to worry about car as well. Travelling to summit is not a free ride, I have to spend $45 to drive on auto road to Mount Washington. Along with ticket I got CD about information about White Mountain. I was wondering how Americans can sell anything and road was private property. Considering ghat section in India, initial drive was not that difficult but later part was tough especially for car as well as for me since I wanted to enjoy abundant beauty, height was providing but keeping eye on road was also important. It was about 12 KM drive to top and 6145 feet from bottom to top. While driving and listening to CD came to know about environmental details as well as auto race which is on this road. I think they should just keep natural environment and abolish this polluting races. On top of mountain there is observatory and it was build in 1932 and it has recorded highest wind speed observed by man 231 miles per hour on April 1934. The weather of Mount Washington is notoriously erratic. This is partly due to the convergence of several storm tracks, mainly from the South Atlantic, Gulf region and Pacific Northwest. The vertical rise of the Presidential Range, combined with its north-south orientation, makes it a significant barrier to westerly winds. Low-pressure systems are more favorable to develop along the coastline in the winter months due to the relative temperature differences between the Northeast and the Atlantic Ocean. With these factors combined, winds exceeding hurricane force occuring many times. Although considering alpine climate I never thought weather can be such harsh over here and I heard stories of few died while trekking to this place. Can't imagine in USA where all latest emergency services available. On top we noticed very old hotel "Tip Top House" and it was build in 1853. Rebuilt of wood with 91-rooms in 1872-1873. The Tip-Top House survived the 1908 fire; today it is a state historic site. There was another hotel built in 1852 - Summit Hotel anchored by four chains on roof top but it was destroyed in 1908 fire. Along with Mount Washington Auto Road—there is Mount Washington Cog Railway (1869). Ethan Allen Crawford built a house on the summit in 1821, which lasted until a storm in 1826. On top I enjoyed most of this man made things but watching mountain range which covers 25% state of New Hampshire was just unimaginable. 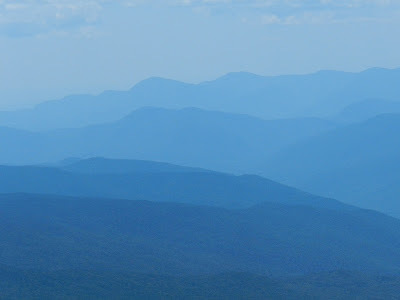 Where you see just range of mountains in blue! No sign of man made concrete buildings and cleaned housing dwelling. It was most unusual USA for me, almost covering 1080 km square! Watching various shades of blue was treat for eyes. While walking around found Appalachian trail. This was the trail I thought of crossing at least once in life time when I visited smoky mountains 10 years back. But fate and circumstances never allowed me to go to that region. I was not in mood of walking but at least thought of walking until hut specifically build for mountaineering enthusiastic. So hear I go without any planning/water for hiking trip of 5 miles to Lakes of the Clouds Hut. It is part of hut system, Apalanche Mountain club has built along the Appalachian trail which is 3515 km long. It is located near two lakes called "blue pond". I had terrific journey going there watching various mountaineers climbing with heavy load of food to hut or other way round. I met group of New Zealand trekkers as well. 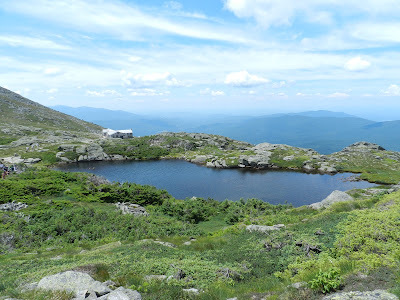 Walking just for 2 hrs made me very thirsty and hungry, I had something to eat at mount Washington and I decided to go back since while going I wanted to cover complete white mountain national park and also two lakes on the way back. So I hurried back. While going I did take my souvenir -- small rock from mount Washington. I wonder how many millions- billions years might have gone to form those little rocks. Anyway those are going to trip with me to Australia for sure. 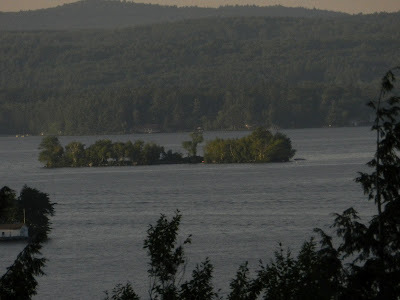 While coming back I visited lush green national park, numerous small lakes and finally Winnipesaukee. Enormous size of lake just amazed me. I also visited small town of New England and wonder how typical England culture survived in this ever melting pot called America. If you check little history about initial american settler you get the answer.